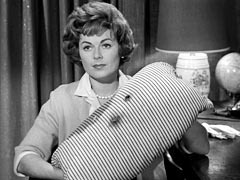 A bitter Mike Preston (played by Bill Williams, Barbara Hale�s husband) is so driven to entrap the man who allegedly crippled him and stole $100,000 that he doesn�t even notice that his housekeeper, Lydia Reynolds, is in love with him. In his haste, Mike makes a big mistake and tries to catch the wrong man. Meanwhile, the real thug sets Mike up and frames him for murder. Perry takes Mike�s case and helps him find a way out from under his problems and his resentments. Mike finally sees the light and gets involved romantically with Lydia. Uncredited Actors: Possibly, Don Anderson appears briefly as a uniformed policeman walking in the foreground as the police survey the crime scene at the well. Submitted by gracep, 12/20/2010. + Anderson also appears onscreen momentarily at a table (with a brunette companion) in the restaurant where Phipps and Jamison meet. Unfortunately, after Jamison sits down and shifts in his seat, we can�t see Anderson any longer. Submitted by gracenote, 7/23/2011. Sightings: That might be Distinguished Gentleman #1 blurred in the background as a waiter in the restaurant where Phipps and Jamison are first talking. But it certainly is the Thin Man as a plainclothesman at the crime scene. He is gathering up an electrical cord and exiting from view as Perry and Paul approach the shack at the well. Later, in the courtroom, Little Old Lady #1 peeks among the spectators, and the Pencil Mustache Man sits directly behind Miss Hamilton. Do you know who they are? Submitted by gracep, 12/20/2010. + But wait, there�s more! Quiet Old Man #1 sits so inconspicuously in the courtroom gallery as to be nearly invisible. And in the final scene, Distinguished Gentleman #1 makes a second appearance as he walks through the hall of the courthouse, past the elevator. Submitted by gracenote, 7/23/2011. Lt. Tragg (Ray Collins) must be extremely busy, because again he fails to appear despite onscreen credit. But thanks to Sgt. Landro (Mort Mills), we can rest assured of excellent police work. Submitted by gracep, 1/7/2010. Lydia Reynolds serves coffee at least twice in cups from the Curious Coffee Set. Submitted by daveb, 12/30/2010. + The Curious Coffee Set displays its popularity again. There�s another set of cups in the Mike Preston home. Submitted by FredK, 11 January 2011. Bob Newhart was a very popular comedian in the early 1960s, soon to go on to greater TV stardom. A staple of his routines was mock phone conversations. At the end of Mike Preston�s telephone call with the airline agent, she uses Newhart�s classic line, �Well, the same to you fella!� Submitted by Mason Jar, 7/22/2011. This is one episode where Paul does not use his signature knock on Perry�s office back door. Submitted by Mason Jar, 7/22/2011. +Ah, but he does! at about 48 minutes in. jfh 26Oct2017. The bottom line on the announcements board behind the "Airline's Counter Girl" (16:16) reads "AL A LEDBETTER OPER". An Al Ledbetter was credited as Chief Electrician for two popular TV comedies from 1963 to 1971. Added by Gary Woloski, 3/24/13. CARS. (1) Mike Preston's dust-covered Willys Jeep M38, no top, Licence No RZS 130. Paula and Arnold have a romantic interlude in a convertible at 11:08 but nothing much can be seen of the car. It might as well be a couch. (2) the Watchman's patrol vehicle is a dark-color 1949 Chevrolet Styleline Wagon, steel body, Lic No B73 620. Like this minus the "Woody" trim. (3) Sgt Landro's 1962 Ford Galaxie Mainliner 4-Door Sedan, B&W with LA County Sheriff star on door. (4) Perry's all-white 1962 Lincoln Continental Convertible, top up. The front licence plate is still missing from front bumper; see Car(2), preceding episode. (5) Elliot Dunbar helps Lydia bring her groceries in from a white car, of which we see only the Right-Front corner (27:37). It might be a 1960 Mercury Montclair or Monterey. (a, b) two 1956 Thunderbirds. The first TBird is light-colored, the second one dark; both have a light-colored removable hardtop installed. See "From the FRONT" and "Note on Portholes" here. The porthole on the front car is visible through the windshield. (c) light-colored 1956 Chevrolet 6-cylinder (no "V" for "V8" below Chevy badge). Unidentified pickup and heavy truck are at exploration site. Added by Gary Woloski, 3/24/13. This is the fifth of six PM appearances for John Bryant. Whether or not he plays the bad guy in any particular episode, I always expect him to be a villain, based on his shifty face and demeanour. Submitted by JazzBaby, 3/10/2019. The joke's on me! I "corrected" the spelling of Abigail Shelton's name in the credits above from Abbagail to Abigail, only to have to re-correct it back to the unusual Abbagail because that is indeed how she was credited on screen. I guess I got ahead of myself! Submitted by JazzBaby, 3/10/2019.